Brynn Albanese made her solo debut at the age of 10 with the Carson Symphony Orchestra in Los Angeles, California. Growing up in Los Angeles within a family of professional musicians, she was exposed to music from infancy. Her Mother was a cellist, Father a clarinetist and her grandfather a concert pianist. The most prominent musician in the family was Opera Prima Donna, Licia Albanese. Brynn studied in Los Angeles from the age of four until seventeen with Elizabeth Ivanoff Holborn. During this period, Mrs. Albanese was the recipient of many first place awards. Some of them include the six-year consecutive winner of the California Bach Festival, VOCE regional and state competitions and the Etude competition. She has served as Concertmaster of the California State Honors Orchestra and Principal Second of the National Honors Orchestra under James DuPriest. She spent her teenage years and early twenties performing and studying at summer festivals such as Interlochen National Music Camp, Ivan Galamians’ Meadowmount School, Blossom Festival, Tanglewood Music Festival and various European venues as well. Mrs. Albanese graduated from the Peabody Conservatory of Music in Baltimore Maryland with the highest honors. She served as Concertmaster of the Peabody Orchestra for four years including a tour in 1987 to the former U.S.S.R. She was a featured soloist with cellist Carter Brey performing “Don Quixote.” Upon graduation, she was the recipient of the Van Hulstein Award for The Most Valuable Musician of the Orchestra. In her last year of college, she was appointed Concertmaster of the Annapolis Symphony Orchestra under the baton of Giselle Ben- Dor. In the next three years with the orchestra, she appeared regularly as a soloist. Also during this period she played and toured with The Baltimore Symphony under David Zinman, had regular appearances at the Walters Art Gallery and was the Assistant Concertmaster of the Baltimore Opera Company. The summer of 1991 and 1992 found her at the Tanglewood Music Festival, where in 1958 her Mother also performed. Both summers Mrs. Albanese was appointed Concertmaster for the first and second Leonard Bernstein Memorial concerts under Seiji Ozawa and Rodger Norrington; she received the Henry Kohn Award for The Most Valuable Member of the Tanglewood Festival. In the fall of 1992 Brynn relocated to Boston where she was appointed Concertmaster of the Boston Philharmonic under Benjami Zander and also Principal Second of the Boston Pops Esplanade Orchestra under John Williams and Keith Lockhart. From 1993 to 1998 she was a regular with the Boston Symphony Orchestra under Seiji Ozawa; she participated in all domestic and international tours as well as all recordings. She has performed under Conductors such as James Levine, Mariss Jansons, George Solti, Jaap van Zweeden, Simon Rattle, Zubin Mehta, Riccardo Chailly, Marin Alsop, Seiji Ozawa, Bernaard Haitink, Kurt Masur, Christoph Eschenbach, Valery Gergiev, Leonard Slatkin, Nikolaus Harnoncourt and many other greats as well. She has appeared as soloist with the Boston Pops Esplanade Orchestra at the acclaimed Boston Symphony Hall under Keith Lockhart. From 1998 to 2005, Brynn lived and worked in The Netherlands. She was the Assistant Principal Second Violin of the Residentie Orchestra under the direction of Evgenii Svetlanov and Jaap van Zweden; some of the groups that Brynn performed with were The Concertgebouw Orchestra, Amsterdam Sinfonietta Chamber Orchestra, Rotterdam Philharmonic and several recital and chamber music series. She decided to return to the United States in 2005 and to settle on the Central Coast of California to pursue her own projects outside of a full-time orchestral life. Other colors of the musical world were beckoning her…. On the Central Coast now since 2005, Brynn has performed numerous recitals and a wide variety of projects over the last ten years. She was Principal Second under Marion Alsop for the Cabrillo Contemporary Music Festival in Santa Cruz for 4 years upon first returning. Her musical life since then has extended far into the non-classical realm as she is the violinist for the extremely popular Gypsy,Tango, Swing, Folk and Wild Classical ensemble, Café Musique. They have performed all over California and beyond. Their performances have extended to France, The Netherlands and Portugal. Currently Brynn is the Concertmaster of many different groups on the Central Coast including Opera San Luis Obispo, Orchestra Novo, Symphony of the Vines and now the San Luis Obispo Symphony. She has appeared a number times as Soloist for the San Luis Obispo Symphony with Café Musique and alone. 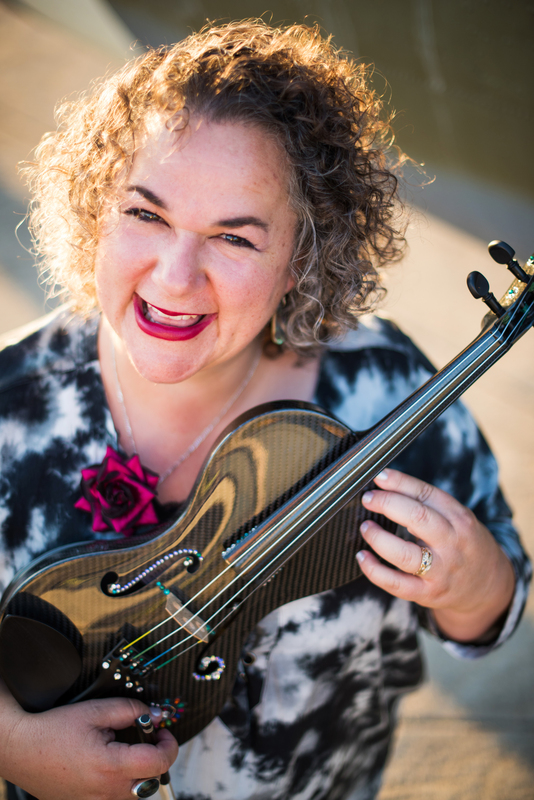 She is becoming widely known in the world of education for her Violin Practice Technique Boot Camps which in 2012 was accepted and presented in Washington D.C. at an American String Teachers Association Conference. Brynn regularly records for pop and folk musicians, has a small private studio and teaches violin at Cal-Poly San Luis Obispo.